Get it? A Pointless Decision. HA-HA-HA!!!!! It’s a pun, a joke, and that’s just what you can expect if you enroll in a comedy traffic school. While comedy, school, and traffic may sound like terms in contradiction, they don’t have to be. Comedy traffic schools, like IMPROV Traffic School, employ a special breed of instructors, best classified as teacher/stand-up comedian hybrids, who take what could be, in other hands, a boring tedious must-get-through curriculum, and turn it into several hours of laugh-while-you-learn driver remediation. “What’s the point?” you ask. There is no point!!!! That’s one of the benefits of enrolling! But seriously, folks, there is more to enrolling in a comedy traffic school course than just erasing points from your driving record. 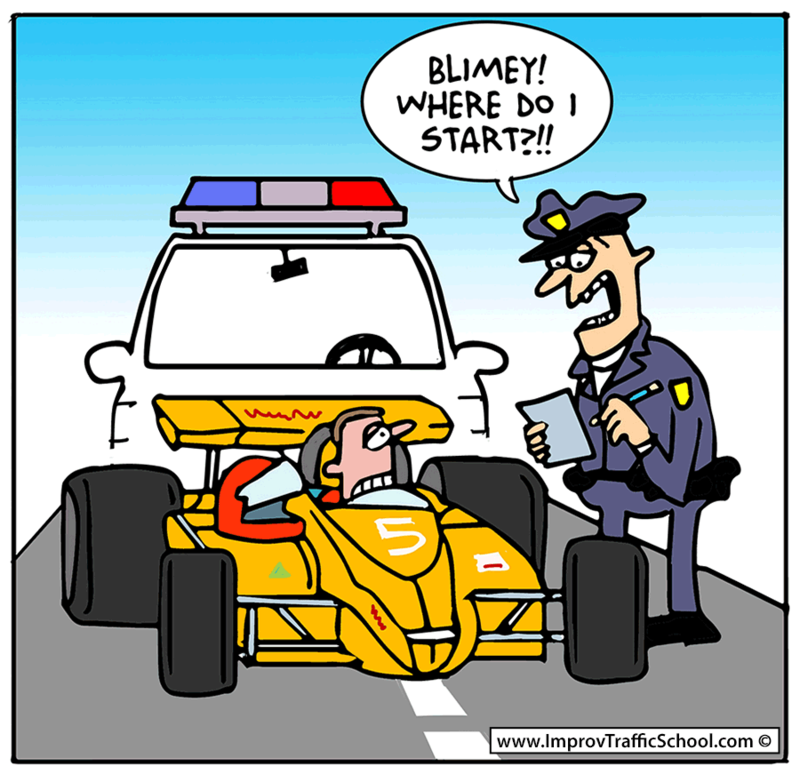 Some states will allow you to spend a prescribed number of hours attending traffic school in lieu of having a traffic violation point(s) appear on your driving record. What you do have to do, however is pay the full cost of the fine. Other states will allow you to erase a specific number of already existing infractions (points) if you take traffic school classes. If you live in one of these states it makes sense to spend a few hours in class since insurance companies will look at your driving record when they establish rates. Any points will signal that it’s time to raise the premium on an existing policy, and should you be looking to change companies, other carriers may outright decline to take you on with too many points. A few states, however, will only agree to forgive the traffic fine, while still recording the violation, but at least you’ll save a bit of money while learning information that can help you change your driving habits so you don’ incur any more tickets down the road. Can Shtick Make Learning Stick? Psychologists have spent years studying whether shtick (defined as a gimmick, comedy routine, style of performance) can be used as an effective teaching tool. Evidence has long pointed in that direction. A cover story, titled How Laughter Leads to Learning, appearing in a 2006 edition of Monitor on Psychology, the journal of the American Psychological Association, stated that research found positive evidence that humor produces psychological and physiological benefits that enhance students ability to learn. The paper goes on to quote a Sam Houston State University Psychology professor as saying “well-planned appropriate contextual humor can help students ingrain information…”; and that is exactly what comedy traffic school instructors endeavor to do. Another advantage of comedy traffic school is that it’s offered online. This means you can take it all in one sitting, or watch as your schedule permits. If your state accepts online instruction as a way to satisfy class requirements, you can take the course, submit proof of completion to the court, and have your driving slate wiped clean, all for one reasonable fee. That APA article quoted a Canisius College interpersonal communications researcher as saying “Students don’t necessarily want Jerry Seinfeld as their instructor. They want appropriate humor that is relevant, lightens the mood, and makes the information memorable.” Taking a comedy traffic school course will give you all that; but sorry folks, you still won’t get Jerry Seinfeld.